Last week was a busy one for Pensacola State. 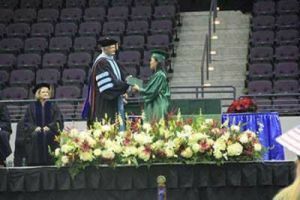 The college family said goodbye to Collegiate High and Adult Education, PALS and Pensacola State graduates during commencement exercises held Thursday, Friday and Sunday. More than 130 students received diplomas from Collegiate High and 27 others earned Certificates of General Education Development during summer and fall terms. Natasha Suggs, a Pensacola State nursing student who lives in Century, delivered the commencement address to the graduates at the ceremony held Thursday in the Jean and Paul Amos Performance Studio. Twenty-five students were awarded Certificates of Completion of the Arc Gateway’s Program for Adult Learning and Support (PALS) at Pensacola State College during the program’s first-ever graduation held Friday in Ashmore Auditorium. Graduates Keyonia Shadell Ikner and William Zackery Schraer addressed the standing-room only crowd while former State Sen. Don Gaetz delivered the commencement message. On Sunday, automobile dealership magnate Sandy Sansing was the featured speaker at Pensacola State’s fall commencement ceremony held at the Pensacola Bay Center. 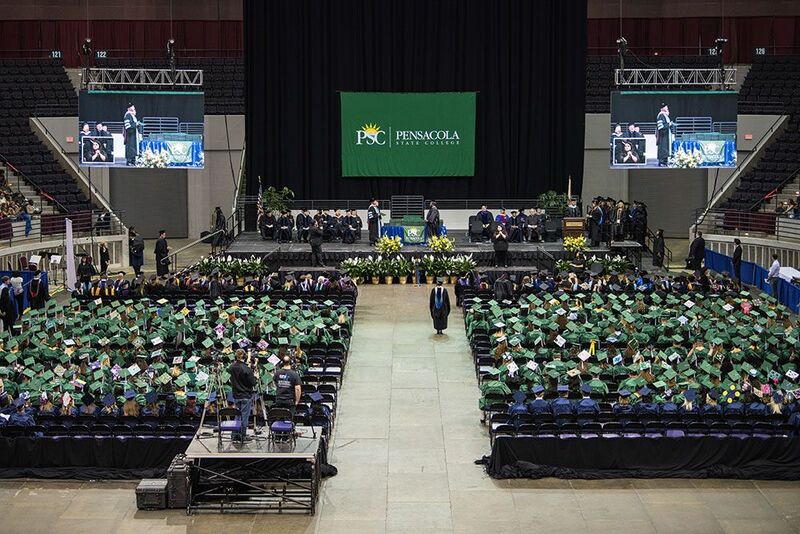 Pensacola State President Edward Meadows conferred bachelor’s degrees, associate degrees and certificates to about 500 graduates at the ceremony. More than 104,000 students have graduated since the college opened in 1948.